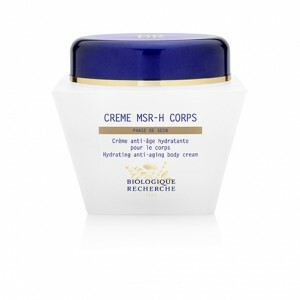 Crème MSR-H Corps nourishes and regenerates the different skin layers. It also protects the skin against external attack and combats the natural cutaneous ageing process, which accelerates with the onset of menopause, as the hormones are no longer there to maintain the hydrolipid film nor the activity of the fibroblasts that are responsible for collagen. As a result, the skin becomes thinner, drier, more fragile and loses its elasticity. It is recommended for mature Skin Instants® and is ideal for pre-menopausal and menopausal women. Rejuvenating and restructuring, this voluptuous anti-ageing cream for the body will coat your skin with a satin glow, leaving it softer and smoother. Ideal for pre-menopausal or menopausal women. Balancing agents: Yam and Soya Extracts, Shea Butter. Moisturising and regenerating agents: Chitosan, Colostrum, Tepescohuite Extract.